The E-Crane is specifically designed for barge and ship unloading, and is a proven and trusted solution in the bulk handling industry. E-Crane has proven itself at ports and terminals, offering complete solutions that ensure high efficiency and productivity as well as fast, efficient solutions for midstream transfer operations. E-Cranes provide longer outreach ranges than typical material handlers, from 24.8 to 47.8 metres (82 to 157 feet). This outreach allows for unloading any type of barge or ship with minimum cleanup. E-Crane duty cycle capacity ranges from 5 to 50 metric tonnes (5.5 to 55 US tons). While most systems dedicated for offloading bulk materials such as grain, coal, limestone, etc. are expensive, inflexible, and require a costly, hard to maintain infrastructure, E-Crane is just the opposite. The E-Crane has a modular design and custom solutions which make it the ideal equipment for any bulk handling applications including offloading Panamax and Handymax sized vessels, barge loading and unloading, ship loading and unloading, feeding hoppers, and stockpiling. E-Crane also offers more than just the crane itself. Turnkey bulk material handling solutions are offered in order to optimize the entire port operation. 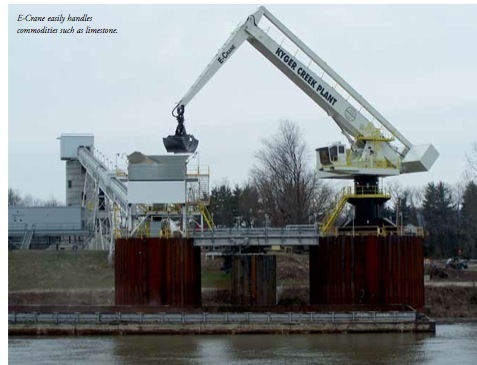 E-Crane streamlines the facility by working with the customer to provide other services and equipment including stationary or linked hoppers, barges and barge haul systems. For handling dry bulk materials such as coal, limestone, bauxite, fertilizer, grain, cement clinker and coke, E-Crane is an ideal solution. The standard E-Crane product line consists of five series of balanced hydraulic cranes (E-Cranes): 700 Series, 1000 Series, 1500 Series, 2000 Series, and 3000 Series. The E-Crane is placed firmly between production line excavators (or material handlers) and large scale dedicated unloading structures. Even the smaller E-Cranes offer much more unloading capacity than the standard excavator. The larger E-Cranes can compete with dedication systems in terms of production and come in at only a fraction of the installed cost with even less annual maintenance costs. The E-Crane product line is rated for barge offloading from 500 to 2,000tph (tonnes per hour). The ‘E’ in E-Crane stands for equilibrium. The E-Crane design is based on an ingenious parallelogram style boom that provides a direct mechanical connection between the counterweight and the load. This unique four-bar mechanism system ensures that the E-Crane remains in near perfect balance throughout its working range. Compared with conventional cranes that require as much as 80% of their available energy just to move the boom, stick, and grab, the E-Crane makes gravity work for you instead of against you, reducing horsepower requirements and power consumption by up to 50% and significantly reducing maintenance and operating costs. Flow-on-demand hydraulics also play a part in lowering power consumption, along with the modular design. This simple, balanced design with modular construction allows for off-the-shelf components for longer service life, but also enables custom solutions. The E-Crane is a truly unique and revolutionary machine with the lowest power consumption cost in the industry. The E-Crane runs on clean electric energy, saving customers huge amounts of money when compared to diesel powered equipment. E-Cranes also have very little associated maintenance costs due to E-Crane's innate design. The key to the E-Cranes efficiency is the parallelogram design linking the stick to the moving counterweight which keeps the E-Crane in near perfect balance throughout its working range. Maintenance on the E-Crane is fast and straightforward due to the innate, simple design of the E-Crane. Since the machine is always in a near- perfectly balanced state, there is less wear and tear on the main pins and components compared to a typical material handler. E-Cranes are serviced using a pit-stop style preventative maintenance system, which the operator can complete in minutes, minimizing downtime and keeping the E-Crane unloading 24/7. E-Cranes also all include the innovative EMM (Electronic Machine Management) system, remote access equipment which allows E-Crane engineers and service technicians to remotely diagnose and fix problems. Utilizing this advanced trouble-shooting system saves customers time and money associated with downtime and maintenance.